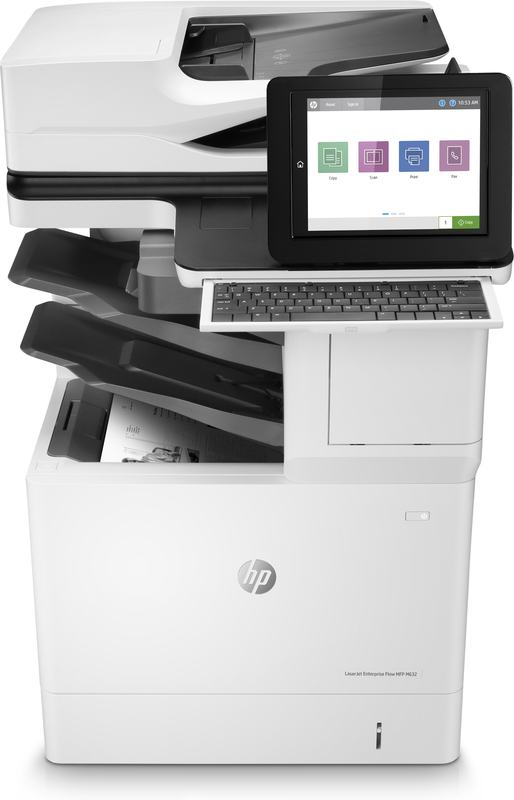 Fast print speeds and mobile printing are just two of the advantages of opting for the HP Enterprise Flow MFP M632z. The unit is energy efficient and ensures that you get a great print quality. The SureStart technology allows the printer to help to protect your documents from external hacks, and it can carry out repairs to prevent further incursions. Duplex printing is a standard feature with the HP Enterprise Flow MFP M632z, and it helps you to save paper and money, making this a more environmentally friendly machine. It has a monthly duty cycle of around 300,000 pages, giving this a long life span, and there is a user-friendly touchscreen to allow for easy operation. The HP Laserjet Enterprise Flow MFP M632z is a multi-function printer that also offers fax, copying and scanning, giving your office all the functions that it needs in one machine. You can print directly from a USB flash drive, send scans to email as well as network and SharePoint, and make use of Google Cloud Print services - so this machine will be useful for those who are working remotely. It has a recommended maximum monthly printing volume of up to 30,000 pages, and it is also AirPrint enabled. The HP Laserjet M632z can produce the first print page in just over 12 seconds, which is actually much slower than other printers in the same range. This is a black and white printer only, so those who require colour printing will need to opt for a different machine. This is a large and heavy machine, so it will not be easy to move. The unit weighs 64.3kg and stands more than four feet high.